There are two great reasons to learn how to weave in ends without a tapestry needle. One, you don’t have to stop knitting to look for that one tapestry needle which has probably wandered off already. Where do they go? Ahem. Two, you can weave in ends as you go instead of putting it off until after the bind off or, if you really loathe working them in, never doing it all. Learning to weave in ends without a tapestry needle can be finicky the first few times you do it, especially if you’ve never done color work, but it’s worth the effort. Not only does it save time during finishing but it’s also versatile. You can use it with stockinette, garter, and in pattern. It still works if you’re increasing and decreasing. The ends will follow the curves and angles of short rows and chevrons without creating extra bulk. While it is noticeable on the wrong side, weaving in ends sans needle is neat and tidy. Plus, it even works with slippery yarns. Sounds pretty cool so far, right? I thought so too which was why I used this method to weave in the ends when I switched colors on the Cuddly Chevron Baby Blanket. The deadline for that blanket left me in a dust with half finished knitting and weaving in the ends without a needle as I went cut out one last step at the end. efore we get started, there’s one you need to know that’ll make learning this technique much easier. It might seem like you’re just knitting as usual with the new yarn but it’s actually wrapping around the tails as you move them back and forth. When it’s time to switch colors (or time to add another ball of yarn), work one stitch in the new color. The tail should be about 6” so you have enough yarn to hold on to. In the opposite hand of your new yarn (if you have the dexterity to do all this with one hand, mad props), hold the tails of both colors together. Wrap the tails around the right needle from top to bottom. Work the stitch normally with the new yarn. Just the new yarn will be caught in the stitch and the tails will fall to the back. This is exactly what you want. Work the next stitch with the tails held behind the needle. Repeat steps 4 and 5 until you’re satisfied with how much you’ve woven in. I usually aim for 1 - 2”. 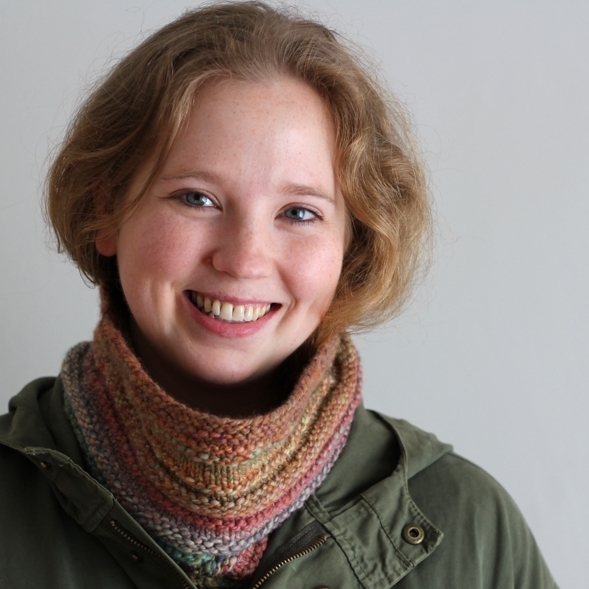 Drop the tails, cut the old color, and keep on knitting with nary a tapestry needle in sight. See how all the steps come together below. Here’s what the woven in ends look like on the wrong side of the knitting. The tails follow the curve of the chevron with no problem and are quite secure. A quick note: I waited to cut the tails until after the blanket came out of the washer and dryer. t the switch between the grey and the blue, the blue yarn isn’t evenly woven in. Since the tails are just wrapped in the working yarn, there’s no need to redo it. Just tug on the tail until it’s neatly in place. What if the tails were woven in too tightly? As shown above on the left, the stripes will pull in and pucker at the change but it’s easy to fix. Gently pull the edge out until to loosen up the tails and straighten the edge like in the right photo. If the tails get pulled out to far, just tug them back into place. Stitch markers come in lots of shapes, sizes, and materials. They can be flexible rubber rings, simple metal triangles, intricate jeweled baubles, or cute beads on wire. You can even make them on the spot from small pieces of leftover yarn, paper clips, rubber bands, or hair ties. Stitch markers can be one continuous piece or able to be opened up and “locked” on a specific stitch. These little tools can do a lot to help with your knitting even if they are easy to lose between couch cushions. Use them to mark the Right Side of your work. When you first cast-on for a garter stitch project, it can be hard to tell the Right Side from the Wrong Side when you pick it up after a break. Take a stitch marker, different from the rest if you’re using a lot of them, and put it a stitch or two in from the starting edge of the Right Side. Pick up your needles and don’t see the marker near the tip? Then you’re on the Wrong Side of your work. Stitch markers can be used to mark more than just stitch repeats. On the Cuddly Chevron Blanket, I placed a marker every time I had to increase or decrease. It kept me from having to count (or miscount) every stitch and left my mind free to listen to podcasts or watch a movie while I knit. 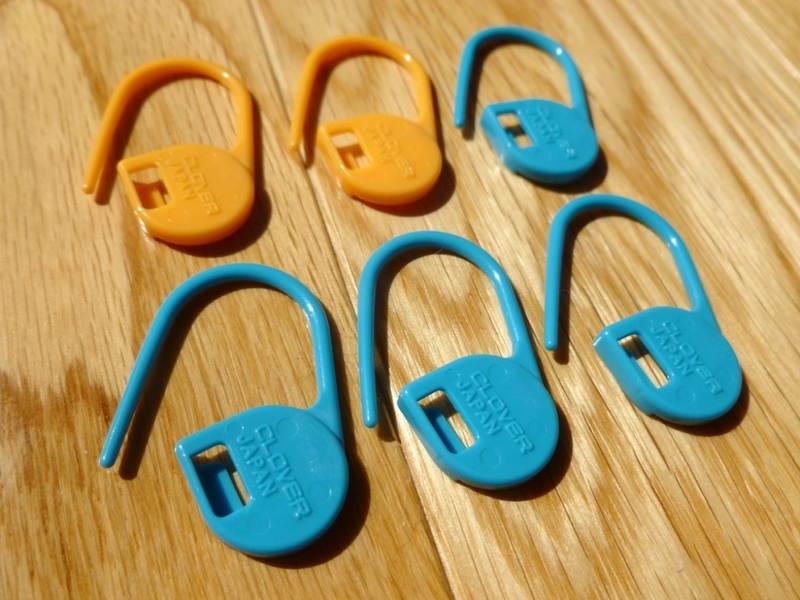 Lockable stitch markers are great for tracking your progress. When you’re working on a big project and it starts to feel like a slog, start your knitting for the day by putting a locking stitch marker on a just knit stitch. When you’re done, you’ll easily see how much you’ve accomplished. This trick is great for seeing progress on sleeves, sweaters, and socks, but can be a bit discouraging if you’re knitting a blanket from the center out. Stitch markers are also great for counting rows. Here’s also where locking stitch markers come in handy again. When you’re starting a new section of knitting and need to knit a certain number of rows/rounds, say for the ribbing on a pair of toe-up socks, put a locking stitch marker on the first row and count from there. You could also put a marker every 5 or 10 rows so you can see how many rows you’ve knit at a glance. Stitch markers are really helpful when you’re casting on a large number of stitches. I can count 20 stitches without losing my place much easier than I can count 400. So, after you cast on 20 sts, place a marker and repeat until you have the required number for your pattern. No miscounting here. P.S. Here’s one last tip for all the hand spinners out there. Locking stitch markers make it much easier to measure the yardage of skeined handspun.